New Delhi, December 30, 2016: The national capital is facing the worst smog in 17 years, according to the Centre for Science and Environment (CSE). The AQI index in Delhi hovered in the range of 376-450 on normal days, whereas the prescribed norms for any city are 50-100 units. Thus, on any given day, the air is 4-5 times more toxic than the prescribed limits. Capital First Ltd. has taken the initiative of raising awareness about air pollution in the city, and also to provide means for protection to those that are most vulnerable to the ill effects of air pollution namely; school children and traffic policemen. The volunteers from Capital First have approached government schools and the traffic police for distributing N 95 quality air pollution masks. 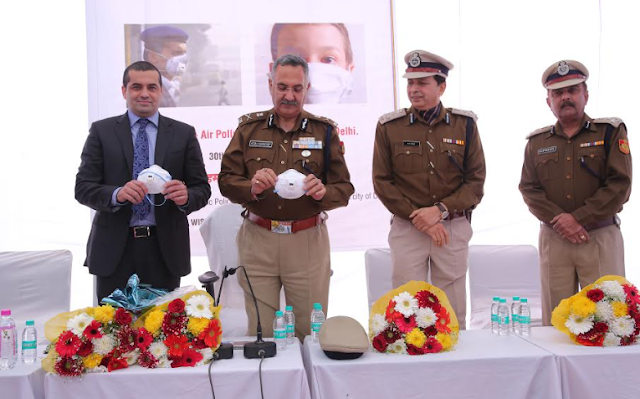 To support this drive, Delhi Traffic Police joined hands with Capital First Ltd., and have organised a special function to distribute pollution mask to Delhi traffic police officials; by Shri. Ajay Kashyap, Special Commissioner of Police at the Traffic Police Headquarters, Todapur on 30th December 2016. Also present at the function were, Mr. A.K. Ojha, Joint Commissioner of Police:Traffic& Mr.B.K. Singh, Additional Commissioner of Police:Traffic, along with senior officials from Capital First. With the aim to educate users about the ill-effects of air pollution, the masks were distributed with a small leaflet in Hindi that explained the rationale for wearing an anti-pollution mask. Capital First Limited is a NBFC specializing in MSME and Consumer financing supported by proprietary credit evaluation methodologies and strong credit scoring platform. The Company offers SME Loans, Loan against Property to Indian MSME players and also provides Home Loans, Two Wheeler Loans and Durable Loans to entry and mid-level salaried employees of Corporates as well as self-employed individuals. The Company has a high long term credit rating of AA+ by reputed Credit Rating agencies. The Company has a Board comprising of reputed professionals with many decades of rich experience in the financial services sector. As of September 30, 2016, the Company has financed over 3 million customers.